Child Fatalities and Critical Incidents. 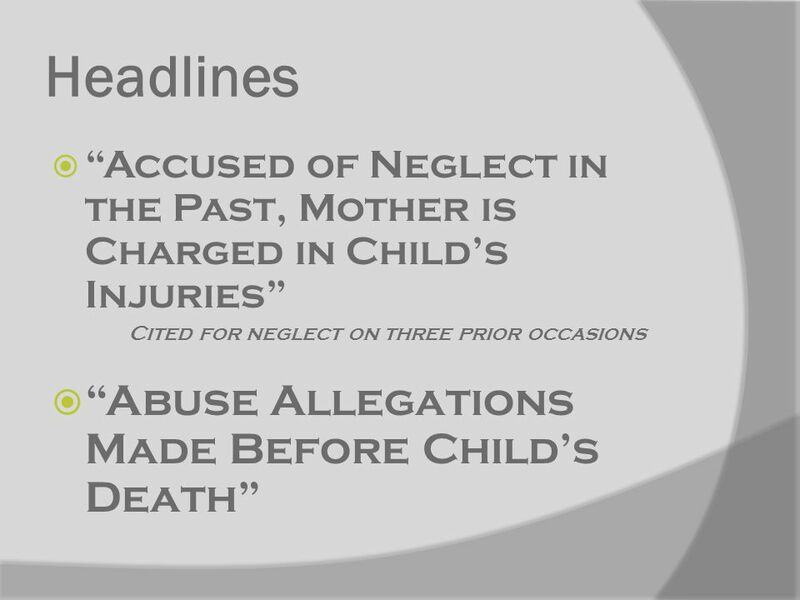 Headlines Accused of Neglect in the Past, Mother is Charged in Childs Injuries Cited for neglect on three prior. 4 What Happens after the Headlines? 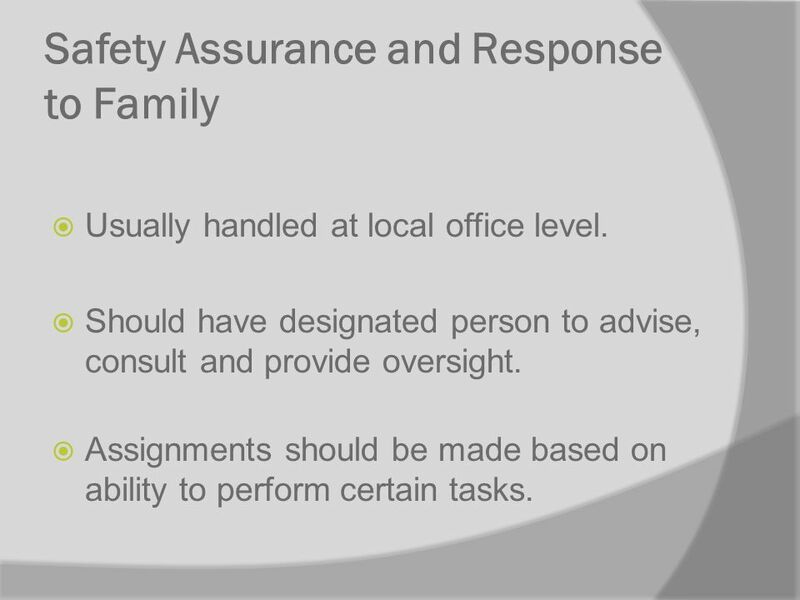 6 Safety Assurance and Response to Family Usually handled at local office level. Should have designated person to advise, consult and provide oversight. Assignments should be made based on ability to perform certain tasks. 7 Safety Assurance and Response to Family May need to do some re-assignments for current situation. CPS safety assessment should occur simultaneously with the agency review process. Develop a support plan for the family. 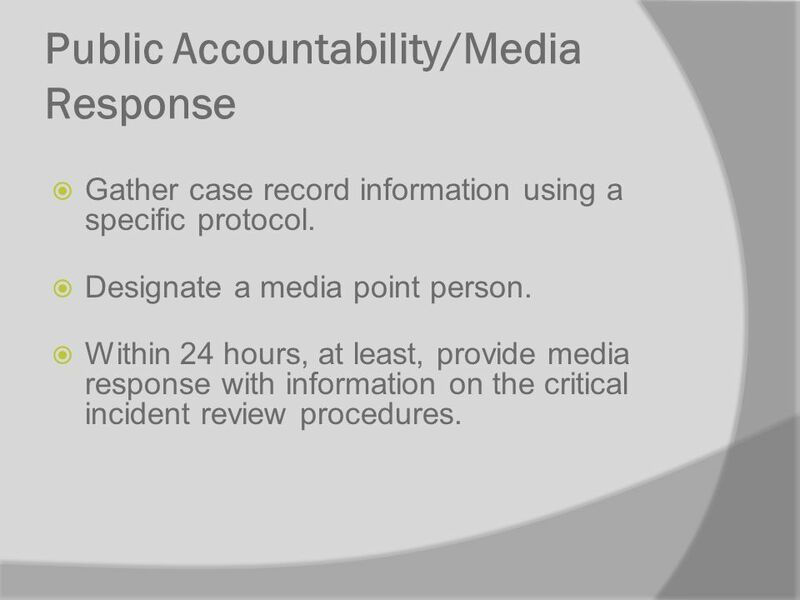 8 Public Accountability/Media Response Gather case record information using a specific protocol. Designate a media point person. 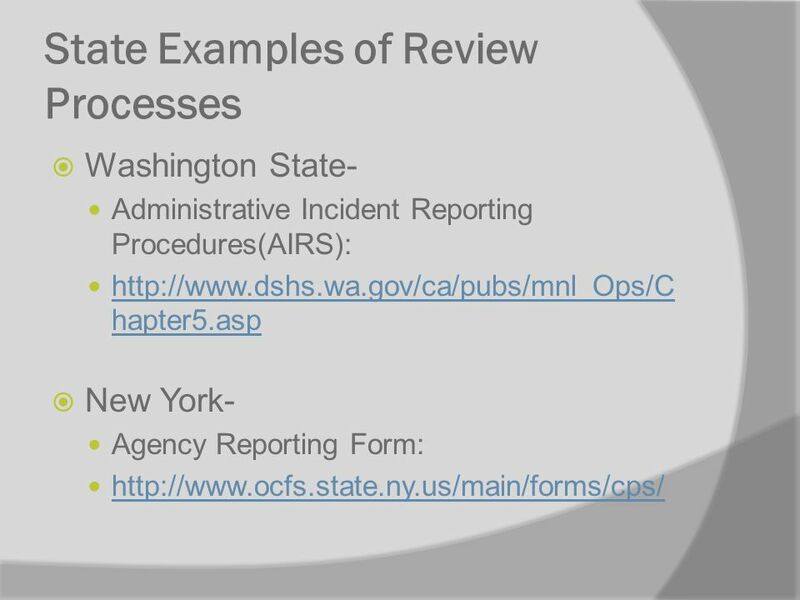 Within 24 hours, at least, provide media response with information on the critical incident review procedures. 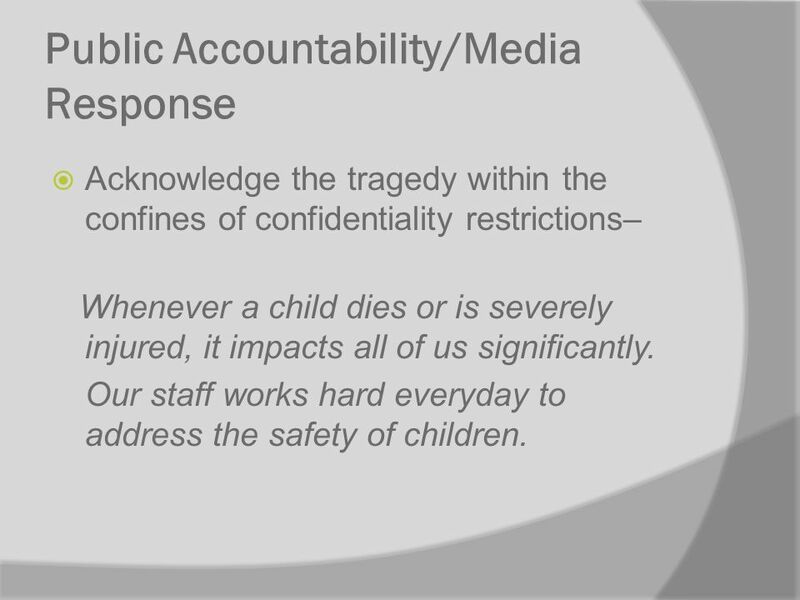 9 Public Accountability/Media Response Acknowledge the tragedy within the confines of confidentiality restrictions– Whenever a child dies or is severely injured, it impacts all of us significantly. 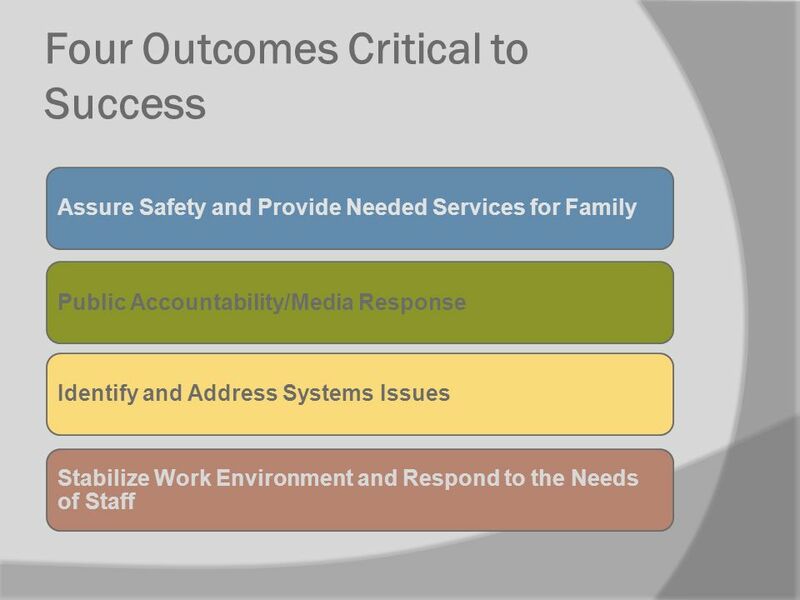 Our staff works hard everyday to address the safety of children. 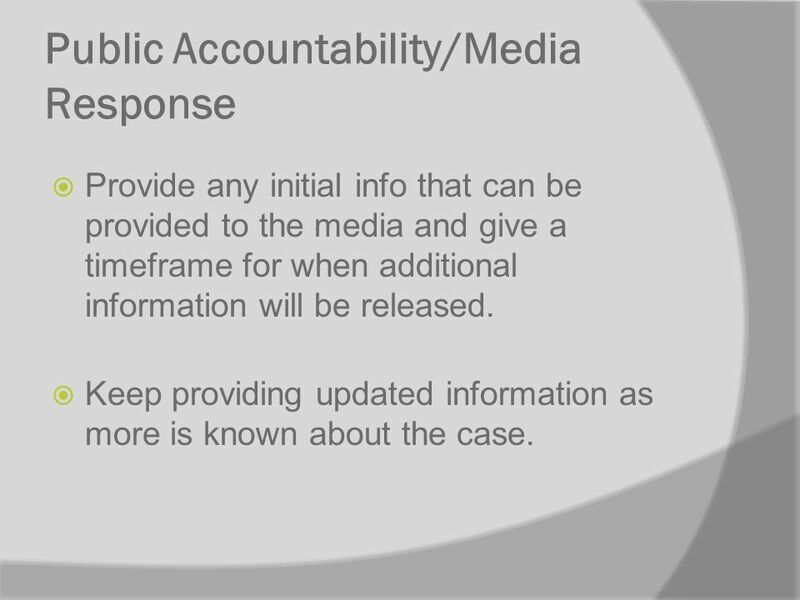 10 Public Accountability/Media Response Provide any initial info that can be provided to the media and give a timeframe for when additional information will be released. Keep providing updated information as more is known about the case. 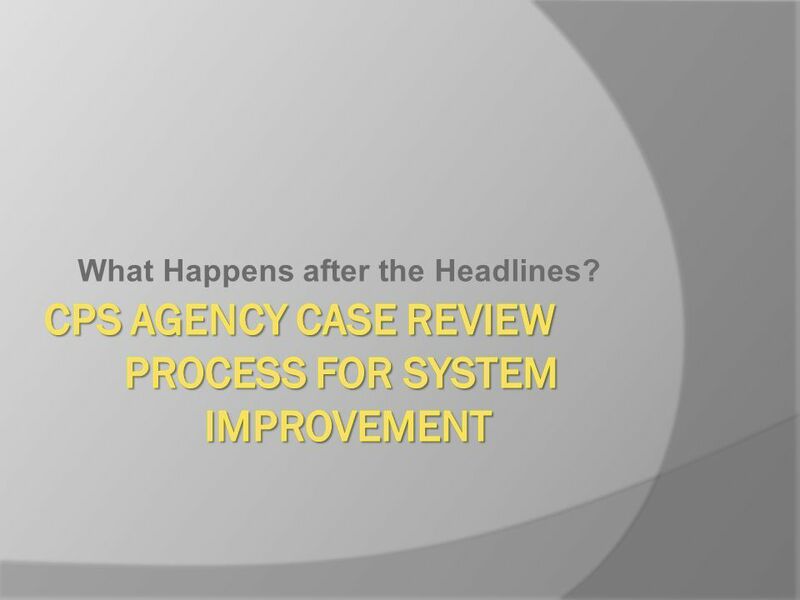 11 Identify and Address Systems Issues Separate reviews of personnel actions from case reviews for the purpose of systems improvement. 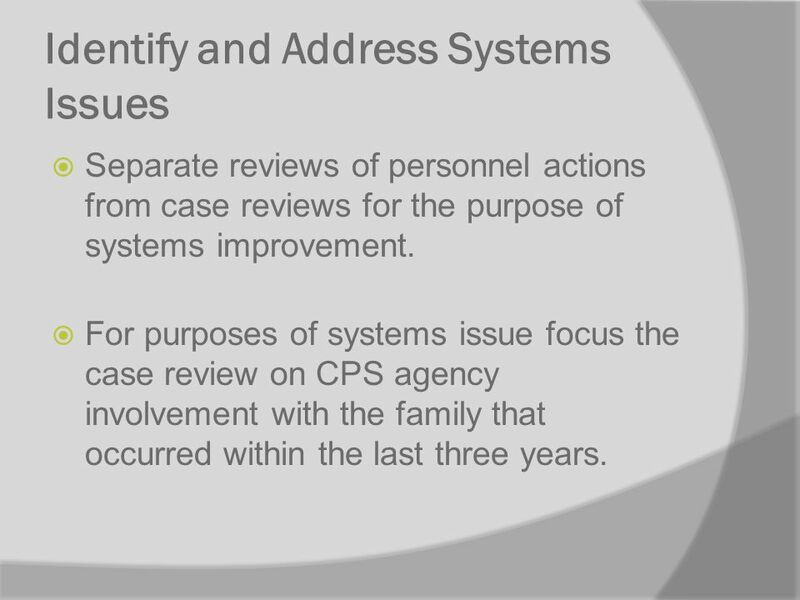 For purposes of systems issue focus the case review on CPS agency involvement with the family that occurred within the last three years. 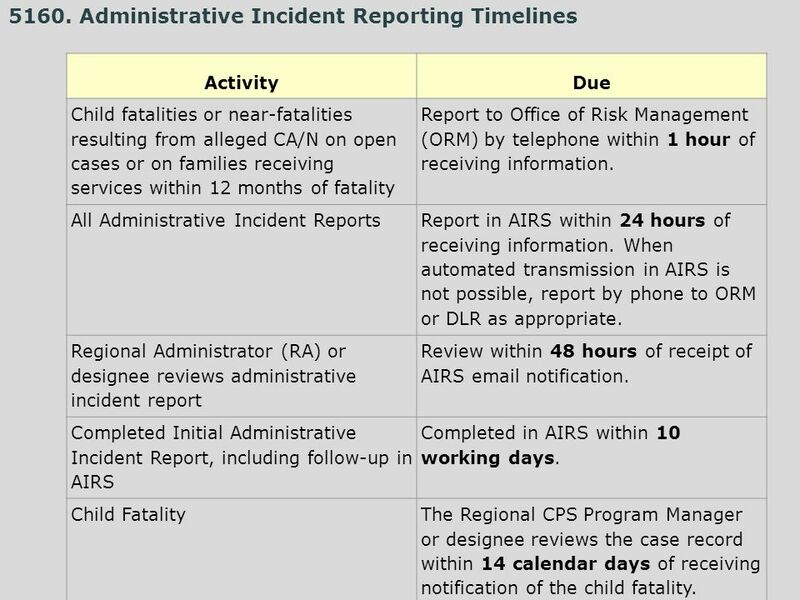 15 Child Fatality The Regional CPS Program Manager or designee provides the RA with a summary of the case within 45 days. 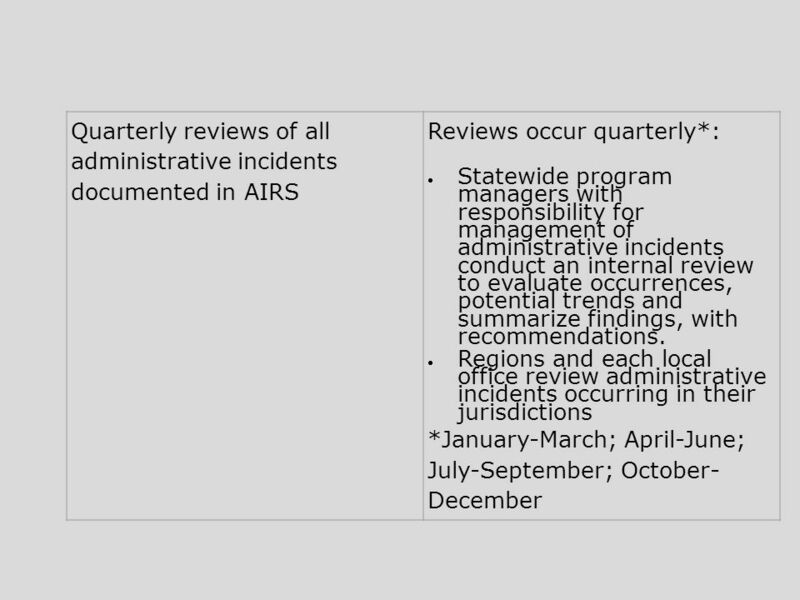 Child Fatality Review (CFR) Final report is completed and documented in AIRS within 180 days of report of fatality. 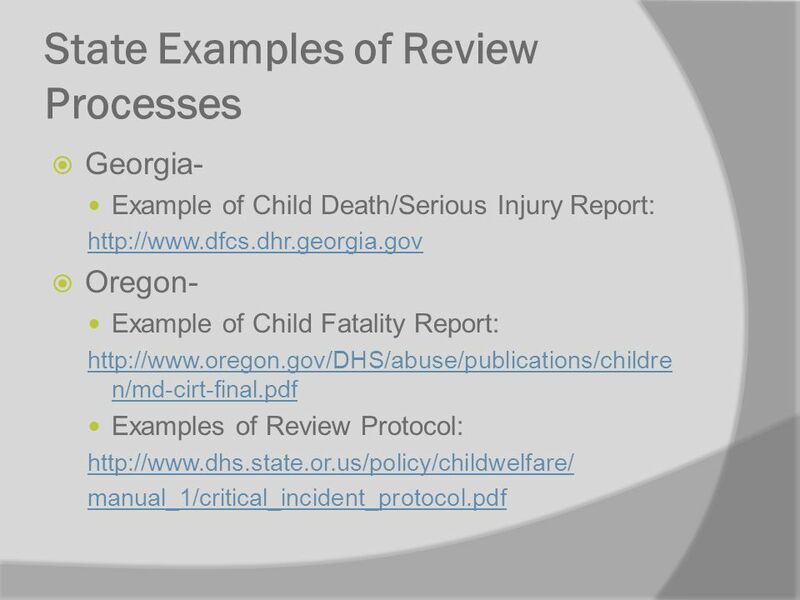 Executive Child Fatality Review (ECFR) Completion of the final report and documentation in AIRS within 180 days of the report of fatality. 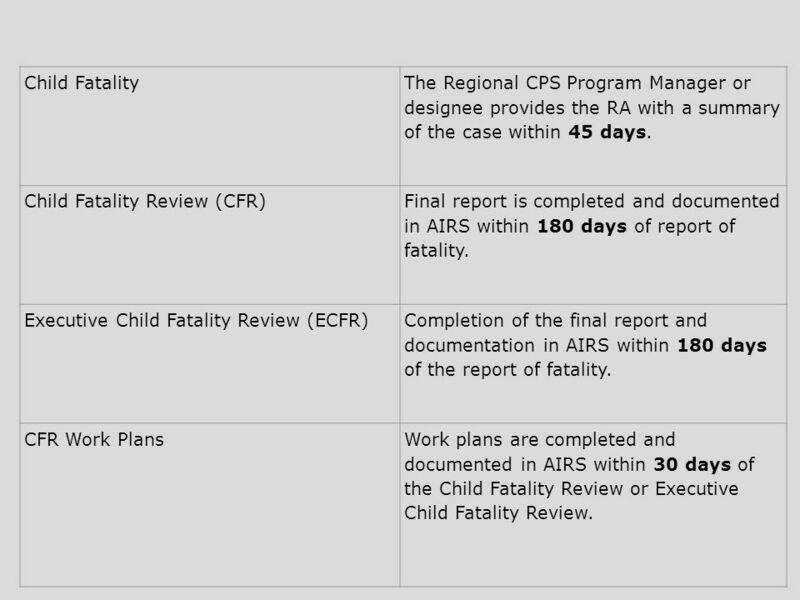 CFR Work PlansWork plans are completed and documented in AIRS within 30 days of the Child Fatality Review or Executive Child Fatality Review. 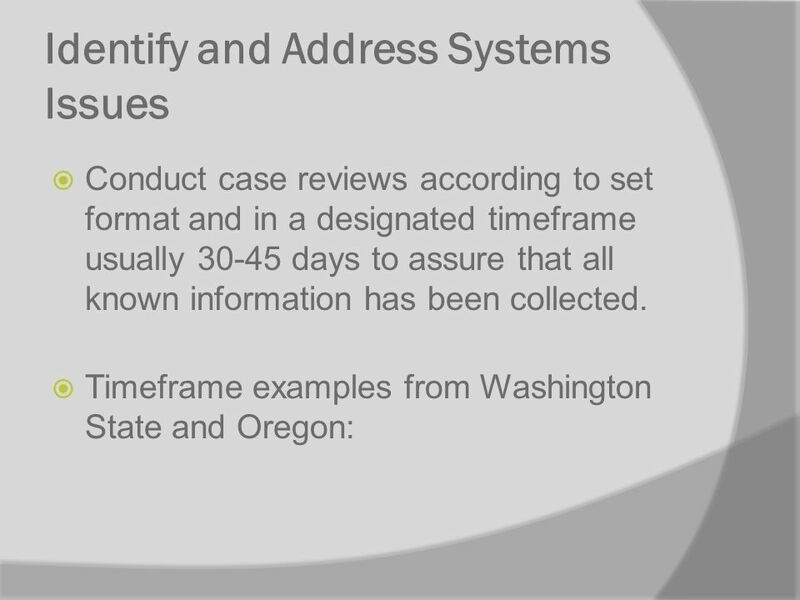 19 Identify and Address Systems Issues Timely knowledge transfer is critical once issues about practice have been identified. Set up a system of routine staff alerts. 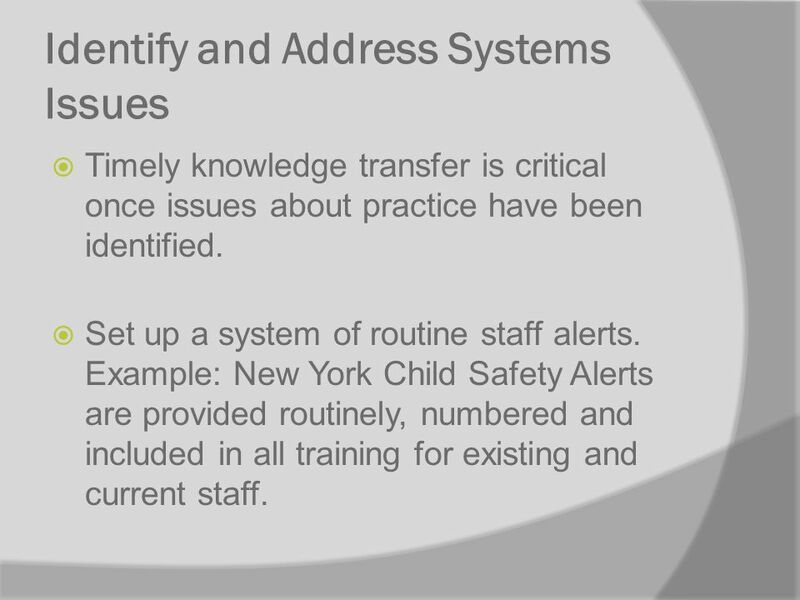 Example: New York Child Safety Alerts are provided routinely, numbered and included in all training for existing and current staff. 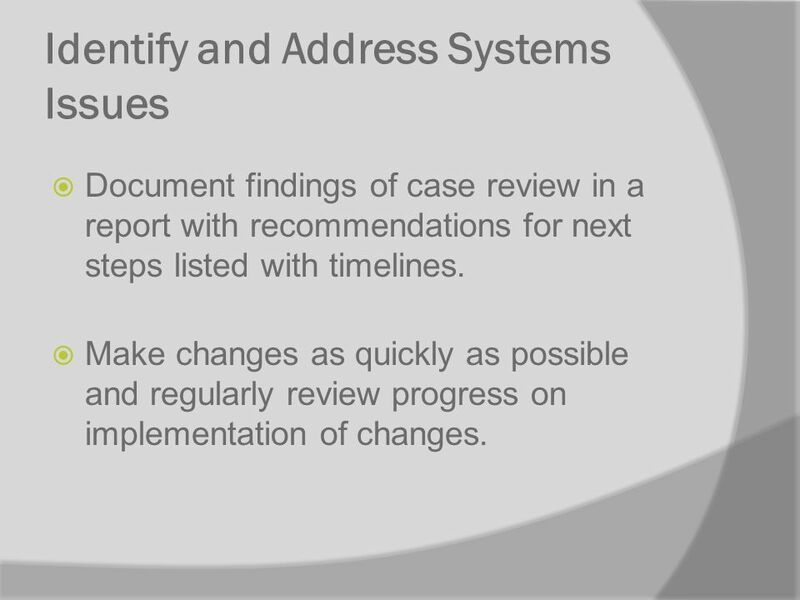 21 Identify and Address Systems Issues Document findings of case review in a report with recommendations for next steps listed with timelines. Make changes as quickly as possible and regularly review progress on implementation of changes. 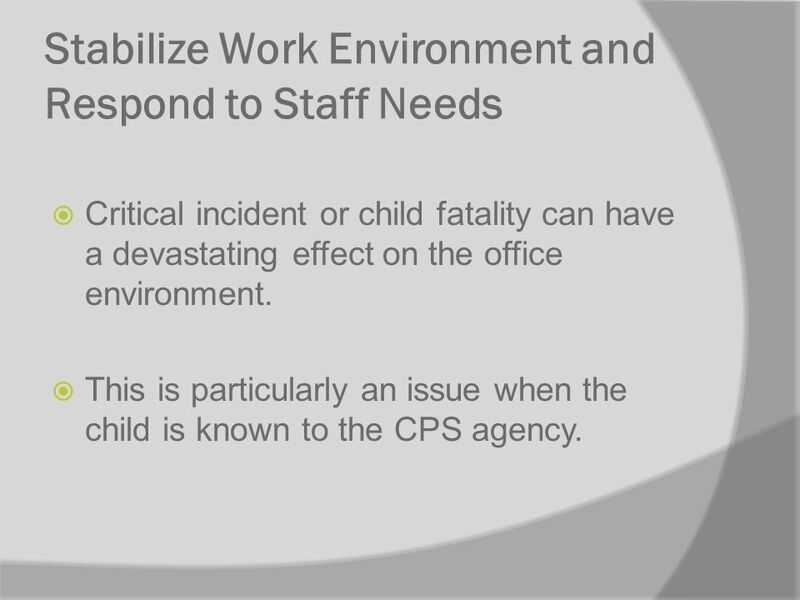 24 Stabilize Work Environment and Respond to Staff Needs Critical incident or child fatality can have a devastating effect on the office environment. This is particularly an issue when the child is known to the CPS agency. 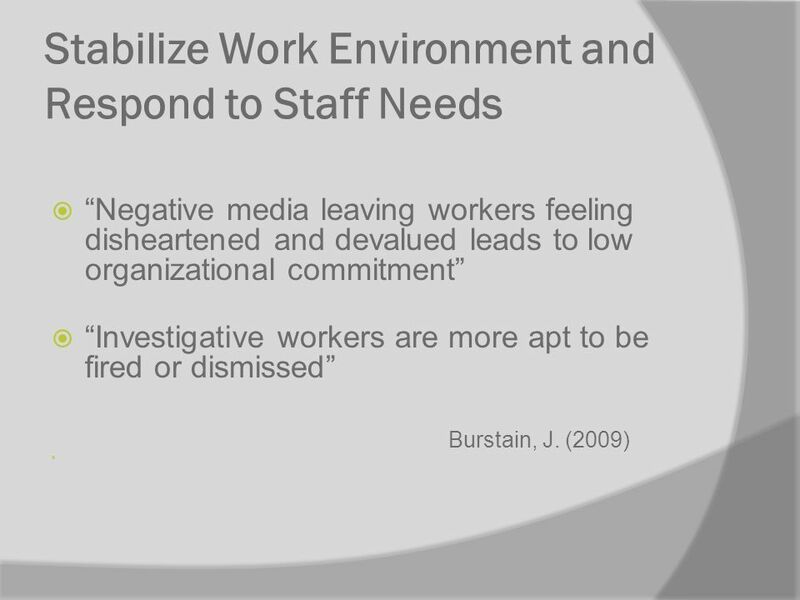 28 Stabilize Work Environment and Respond to Staff Needs Constant media reports can keep the strain on the office active. 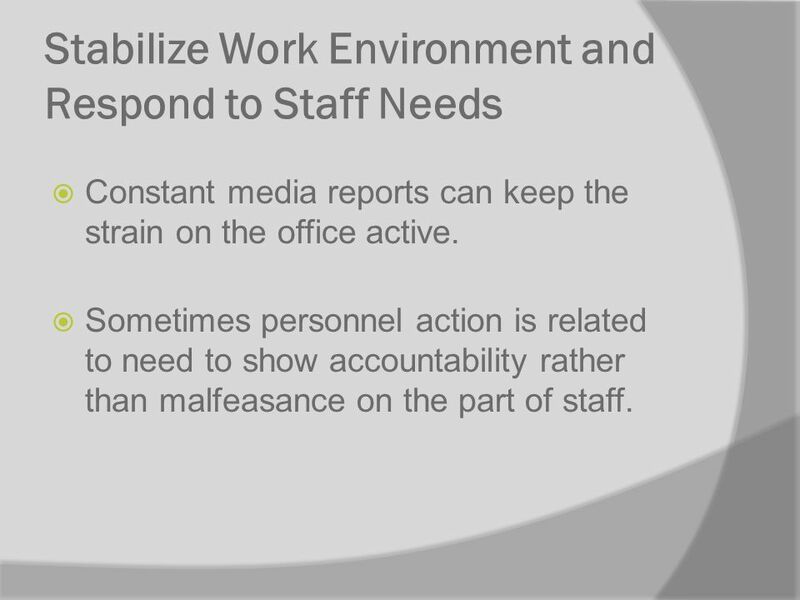 Sometimes personnel action is related to need to show accountability rather than malfeasance on the part of staff. 29 Stabilize Work Environment and Respond to Staff Needs Supervisors and managers as well as caseworkers need regular training updates on the impact of secondary trauma. 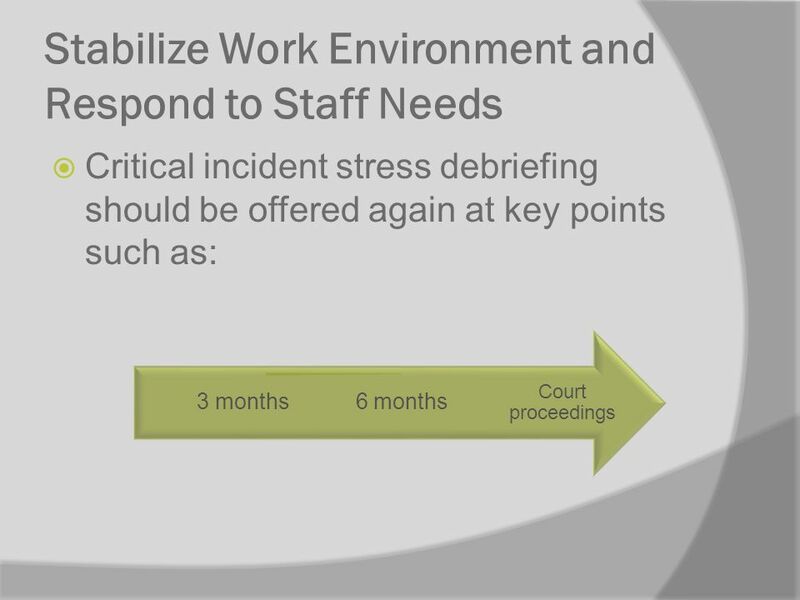 Any critical incident stress debriefings should be provided by uninvolved parties. 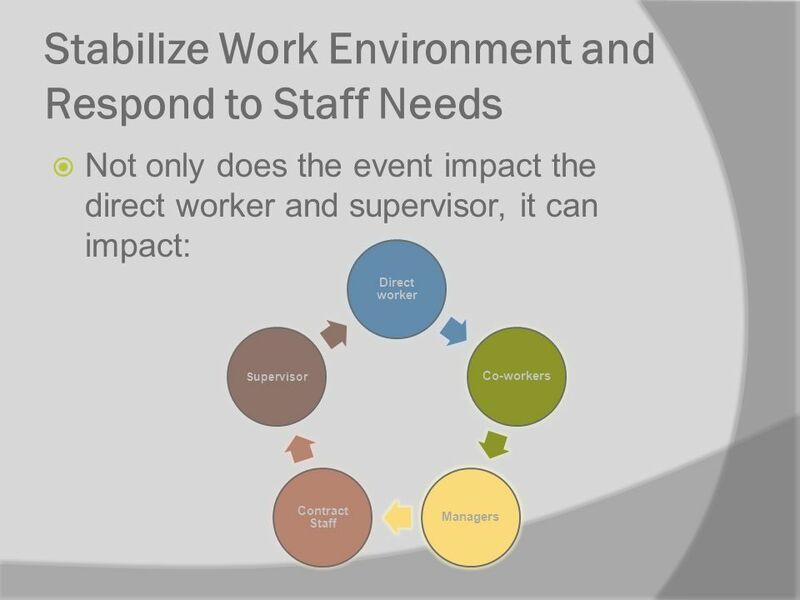 30 Stabilize Work Environment and Respond to Staff Needs Keep in mind that just like the grief process, staff may be in shock and denial in the early stages of the event. 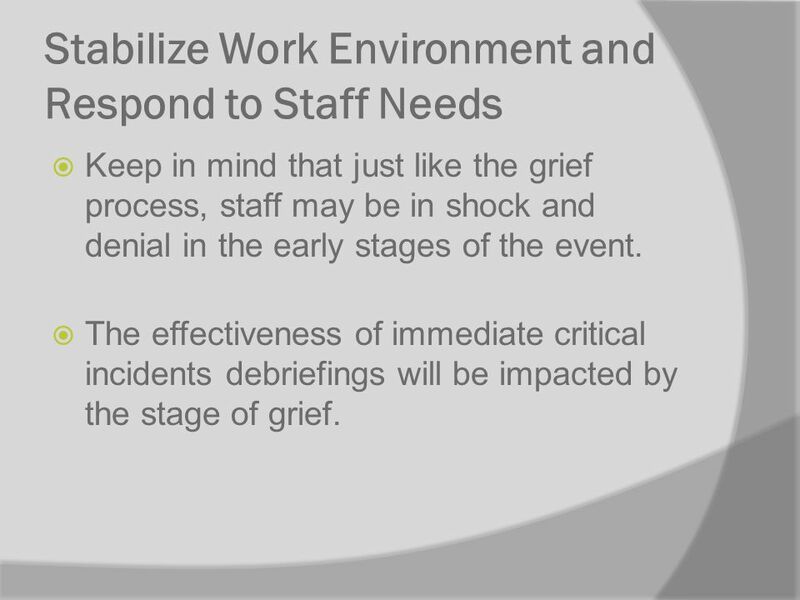 The effectiveness of immediate critical incidents debriefings will be impacted by the stage of grief. 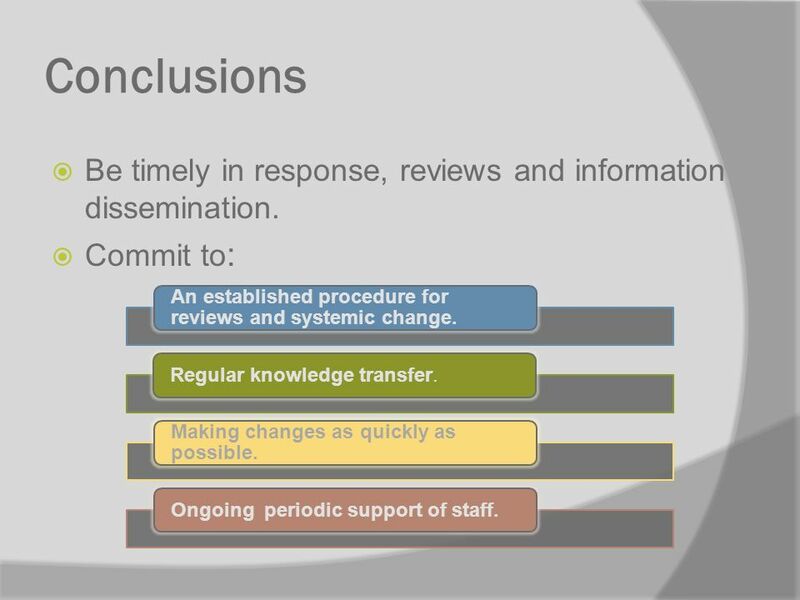 33 Conclusions Be timely in response, reviews and information dissemination. Commit to : An established procedure for reviews and systemic change. Regular knowledge transfer. Making changes as quickly as possible. Ongoing periodic support of staff. 35 References 1. 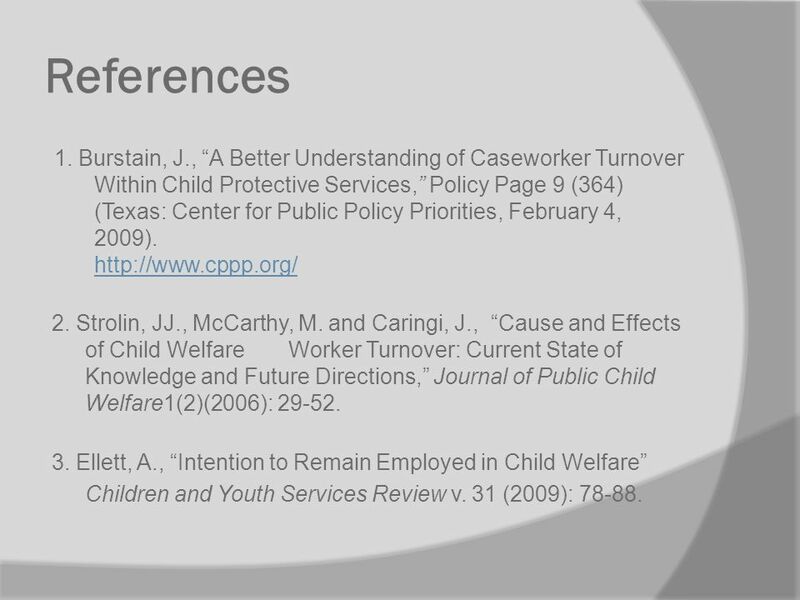 Burstain, J., A Better Understanding of Caseworker Turnover Within Child Protective Services, Policy Page 9 (364) (Texas: Center for Public Policy Priorities, February 4, 2009). http://www.cppp.org/ http://www.cppp.org/ 2. 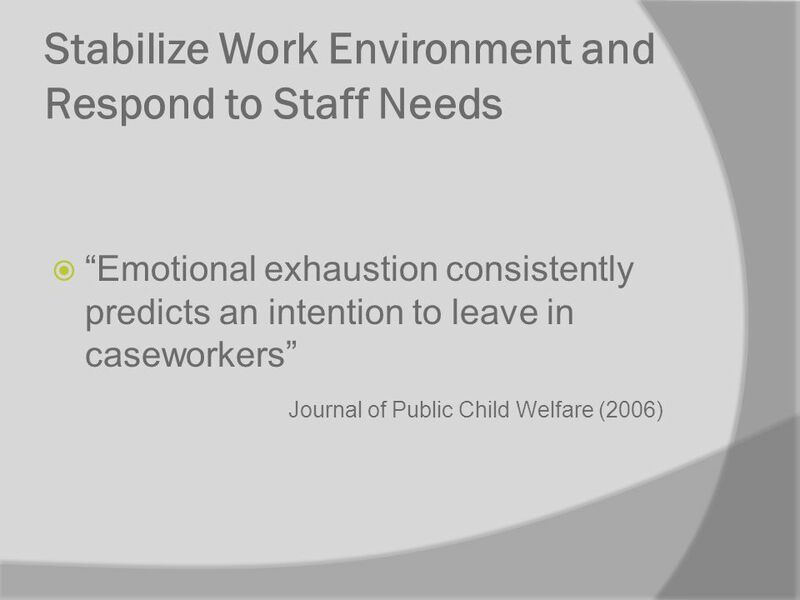 Strolin, JJ., McCarthy, M. and Caringi, J., Cause and Effects of Child WelfareWorker Turnover: Current State of Knowledge and Future Directions, Journal of Public Child Welfare1(2)(2006): 29-52. 3. 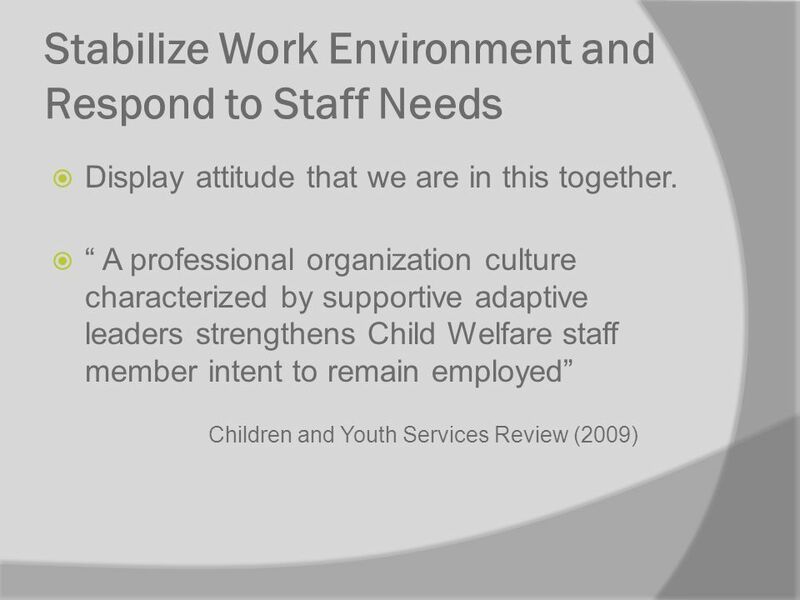 Ellett, A., Intention to Remain Employed in Child Welfare Children and Youth Services Review v. 31 (2009): 78-88. 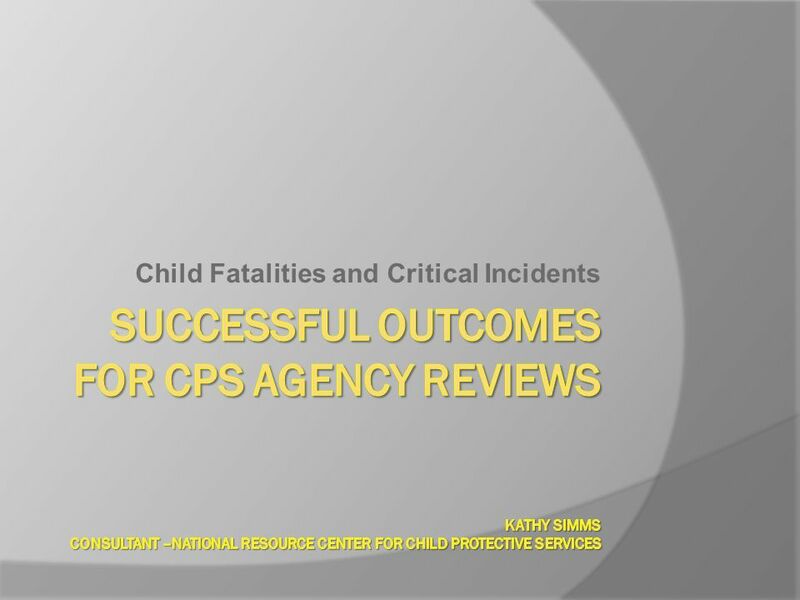 Download ppt "Child Fatalities and Critical Incidents. 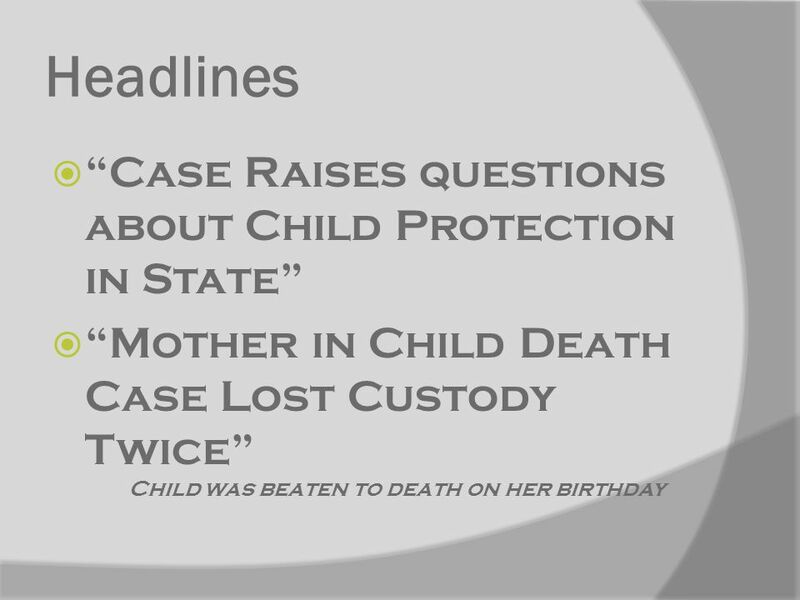 Headlines Accused of Neglect in the Past, Mother is Charged in Childs Injuries Cited for neglect on three prior." CITIZEN REVIEW PANEL Theresa Costello, MA Director National Resource Center for Child Protective Services. Differential Response and Data American Humane 2007 Conference on Differential Response in Child Welfare Patricia Schene, Ph.D.
Office of Legislative Audits Department of Legislative Services 1Presentation to NSAA Certain Aspects of the Child Welfare System Performance Audit Presentation. 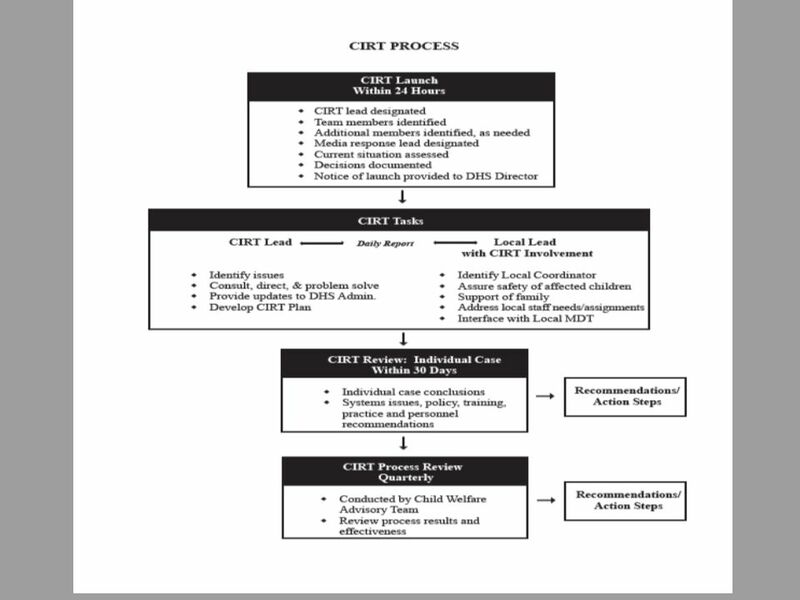 Critical Incident Reporting System [CIRS] Other Incidents A/N/EFraud. Title X Objectives How Writing Measurable Objectives Helps DSHS Evaluate the Success of Your Title X Project. 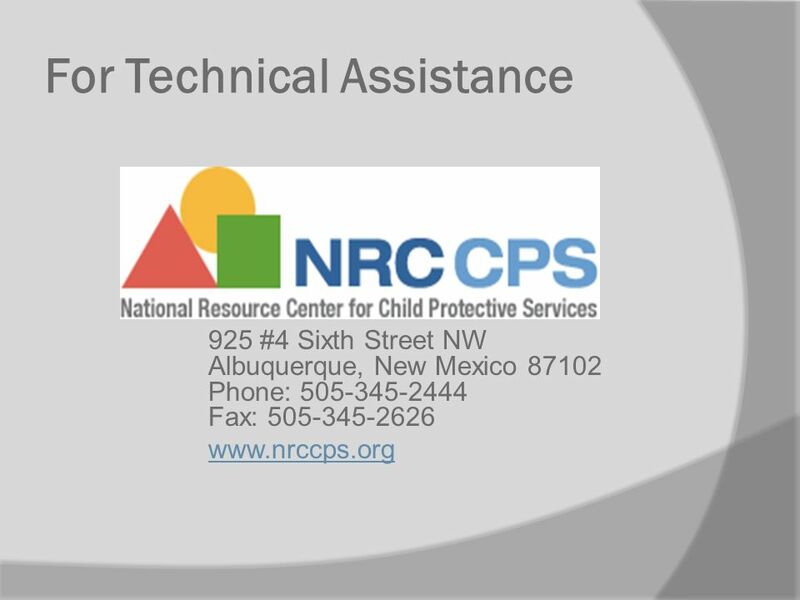 1 Child Care Resource and Referral (CCR&R): FY 13 Contract Renewal Proposal Summary Presentation January 2012. Part 2 Private Psychiatric Service Providers. Welcome and Introduction Welcome to Part Two of Webinar for Private Psychiatric Service Providers CEUs ODMH. 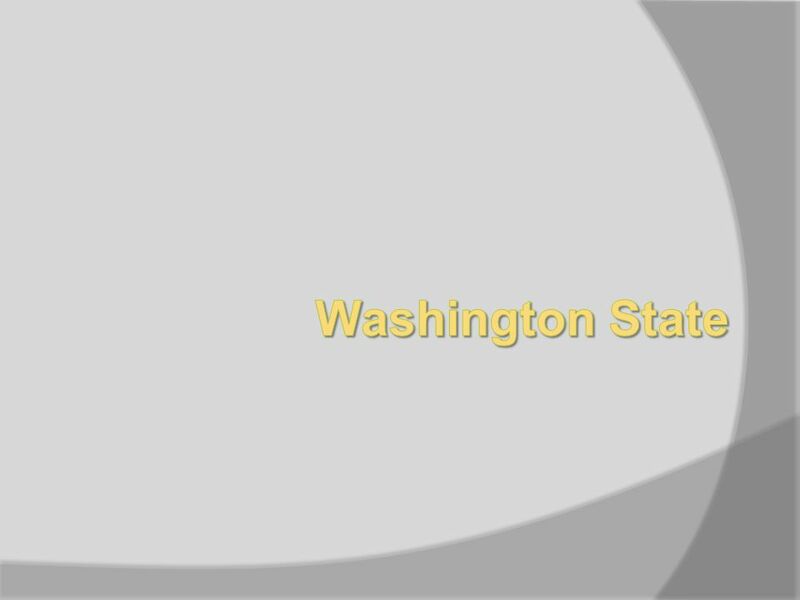 Image zone Incident Reporting Instruction – Technical Update.